Successfully Added Fingerprint Time Attendance Access System with Data Recording to your Shopping Cart. Revealing the revolutionary fingerprint access clocking in/out system for businesses. No more cards, no more paperwork, no more hassle! This digital fingerprint access terminal and data logger registers finger prints for time management. The purpose of this device is to help employers record employee attendance data while also helping workers clock in quickly and easily (you can lose a card, but you can't lose your finger!). 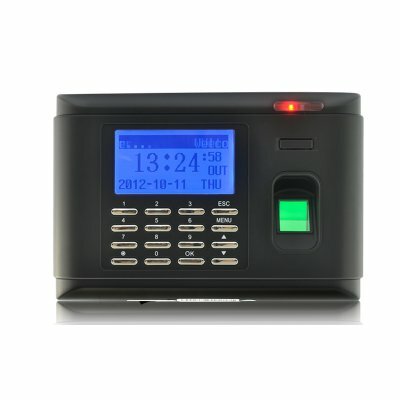 This model fingerprint time attendance unit helps companies to manage attendance records more easily (it comes with professional attendance software that lets you create different shifts, set holidays, and automatically create attendance reports showing who came late or left early, who took vacation, etc). 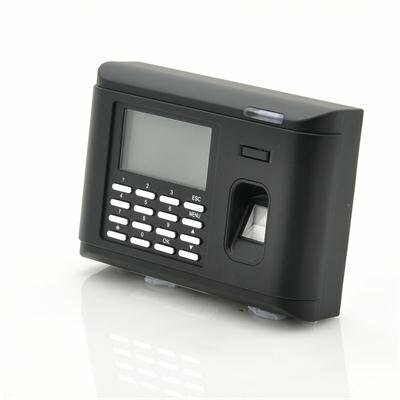 This fingerprint time attendance device is perfect for company HR Managers of any small or medium sized business. This device will work wonders in making your job easier while also making it possible to more closely monitor employee time, thereby saving your company money and time. Do you know what Buddy clocking is, and how much it can cost your profitability? "Buddy-clocking" is when a co-worker clocks in or out for another employee. With text messaging and the widespread use of cell phones, it is easy and convenient for an employee to text a co-worker and say "hey, can you punch in for me, I'll 15 minutes late." Well, with the CVKC-G112 those days have come to an end! Now your company will be able to capture every minute of work you pay for. Designed with 3 cool functions that lets you retrieve data through a network with TCP/IP, download data with a USB key, or connect to a computer with a USB cable, you have easy access to the machines stored data. View every entry and exit logs, along with individual personal details anytime you like - daily, weekly, monthly, whatever. The provided software allows the computer user to view a variety of recorded data such as, Employee ID, Employee History, Attendance Records for Time Period, Gap Reports, Overtime Analysis, Early and Late Reports by Employee or Group, and many more. This function is immensely beneficial to any business and will assists your HR & Admin department to run like clock work with amazing efficiency. The perfect resale item to sell to your bigger clients or install in your own office, click "Add to Cart" now and let us ship you one today. The CVKC-G112 is in stock right now and is available to you straight from the leaders in factory direct wholesale electronics, Chinavasion. Industries most user friendly software to provide you with a quick way to reading and analyze the systems recorded data and information. The finger scanner unit is also a portable unit that can be mounted in a variety of locations and even carried around thanks to the built-in rechargeable battery. Provided with a wall mounting bracket, once fixed in the desire location you can lock the finger print scanner in place with the key provided. Then if you ever need to take it back to your desk to download the information you can then unlock it using the key and slide it off the mounting bracket. This product comes with very sophisticated time attendance data analysis software. It may take 8-10 hours to become familiar with all the functions of the included software. As the wholesaler, we can't provide instructions on installations. If you have questions regarding the use of this product you will need to search internet forums related to home security. We cannot give any support or advice on how to use this product.